In 2001, the Van Der Sluijs family moved from the Netherlands to East of Olds. 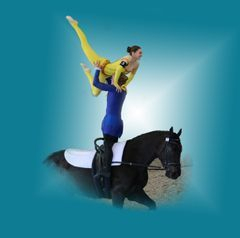 With many years of experience as members of a vaulting club in the Netherlands, they started the Meadow Creek Vaulting Club to be able to continue vaulting in Canada. In 2003 the club was officially formed as the Meadow Creek Vaulting Club! As a Not-For-Profit organization, as we aim to provide affordable equestrian sport to everyone. We fundraise to keep our lesson fees affordable, provide safe and good quality equipment for training and well-trained horses to provide a safe and fun environment to all our vaulters. Since it's early years, the club has seen tremendous growth in its programs and memberships. The club offers a variety of programs, ranging from beginner up to international level. Anyone 6 years and up can join, including adults!